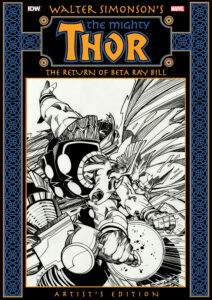 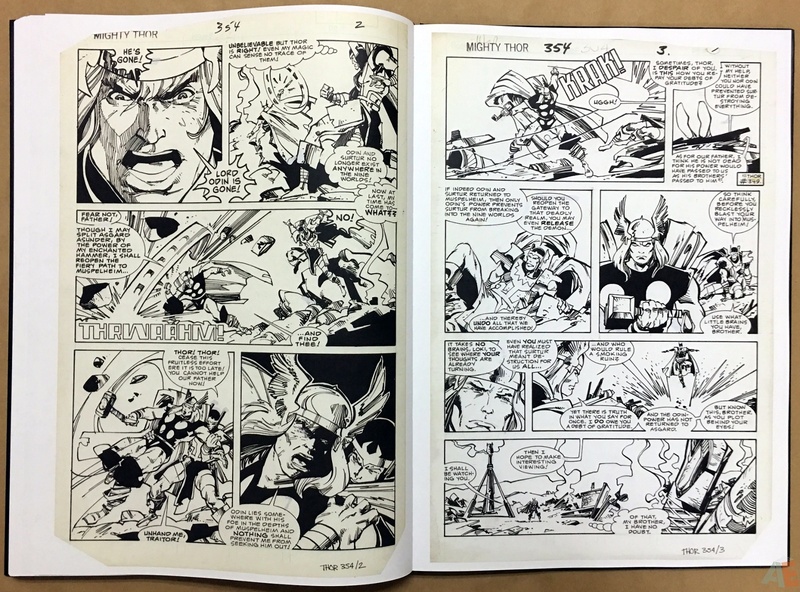 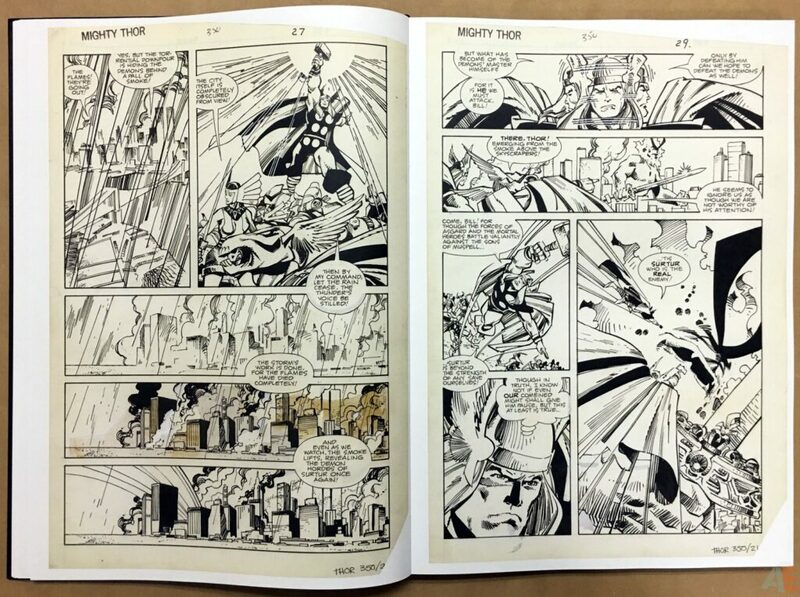 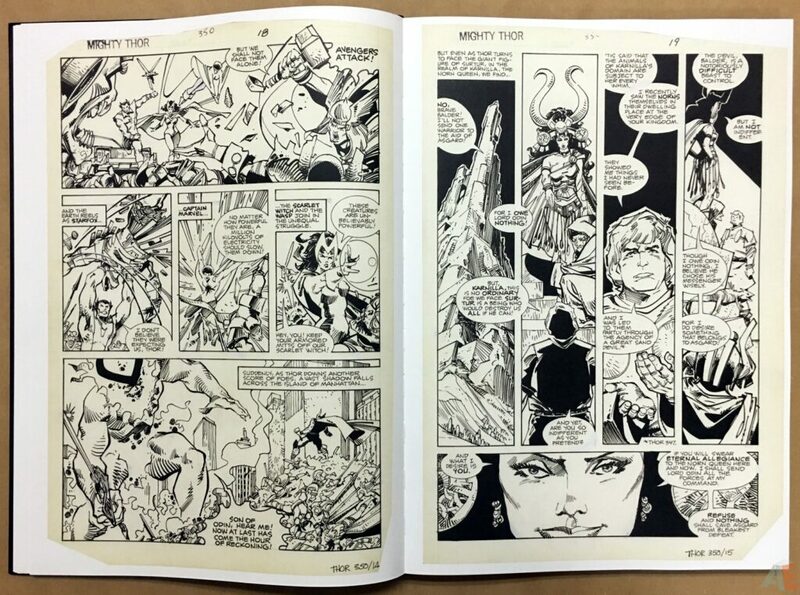 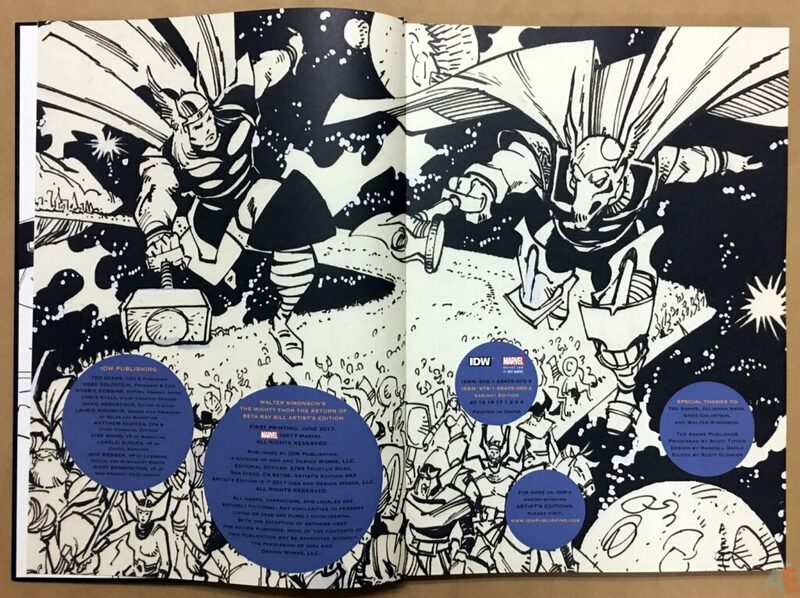 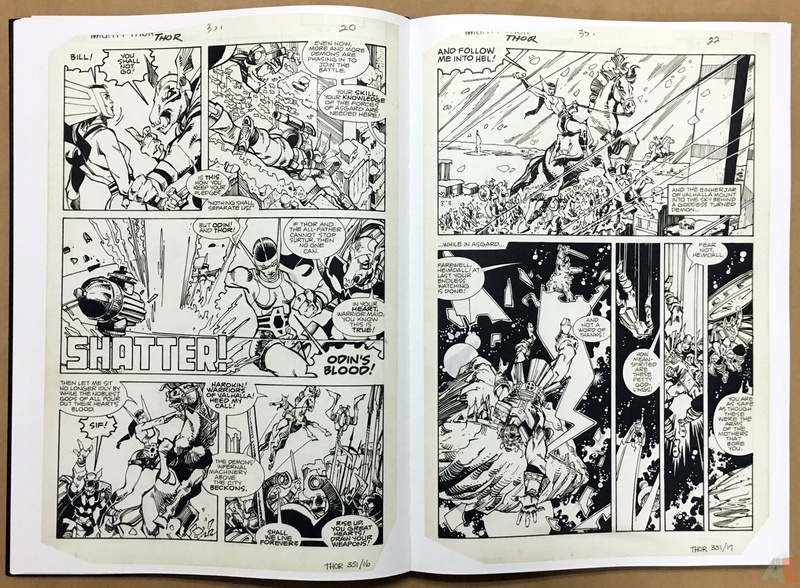 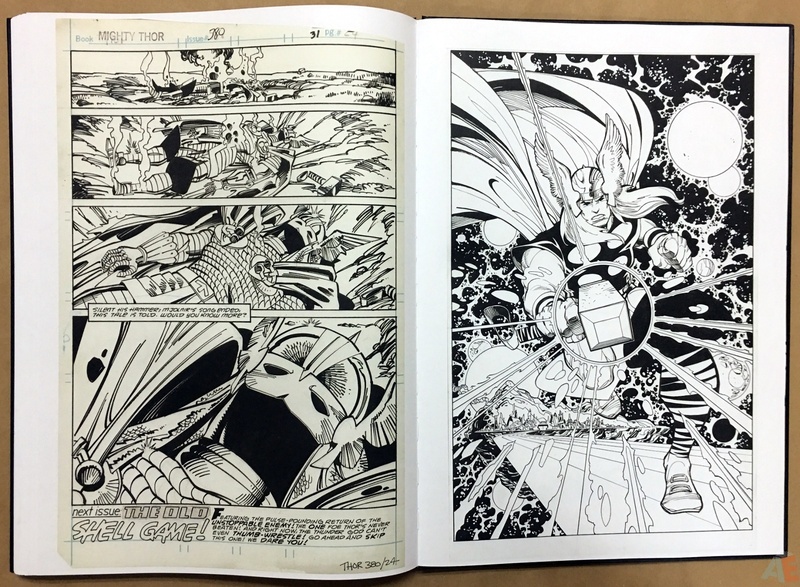 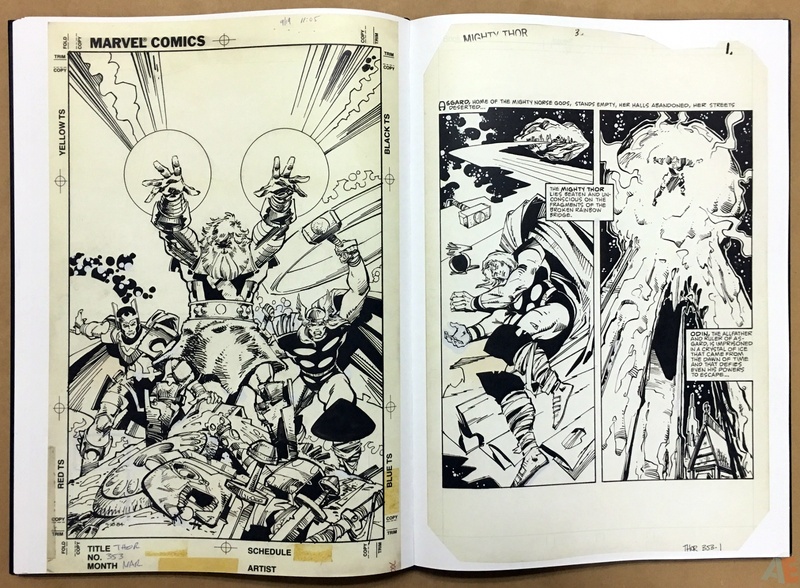 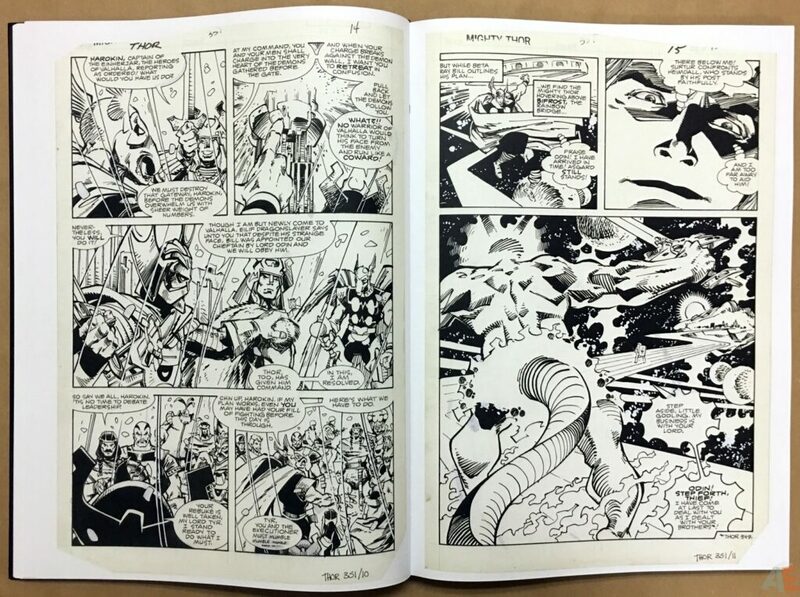 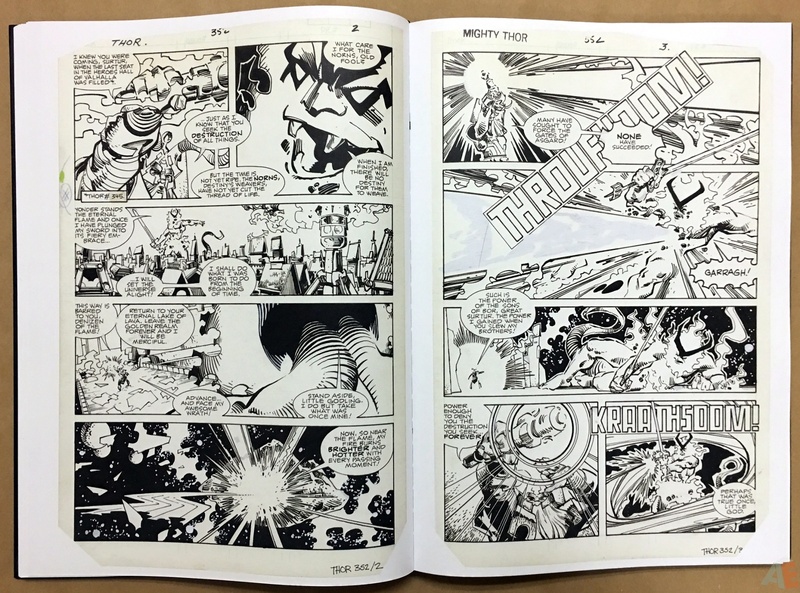 IDW’s second Artist’s Edition dedicated to Walter Simonson’s Thor and Beta Ray Bill. 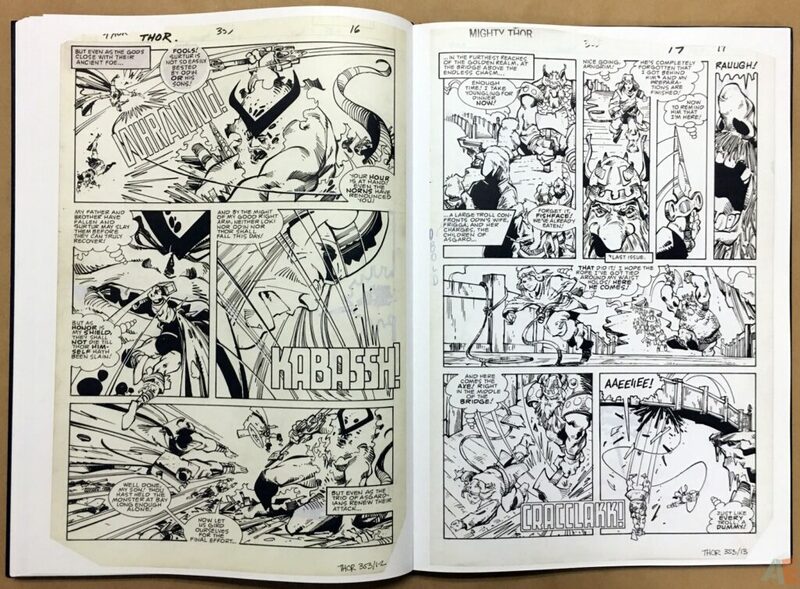 When it’s this good a second helping is just what we needed. 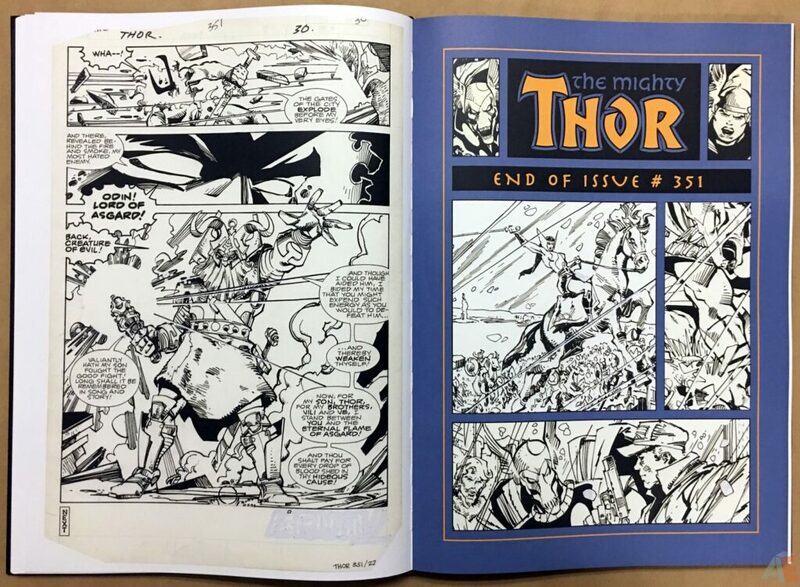 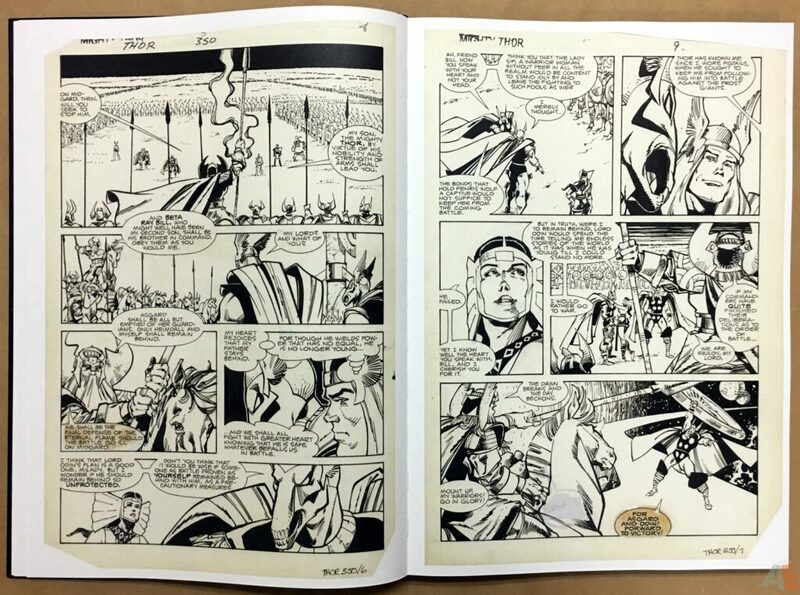 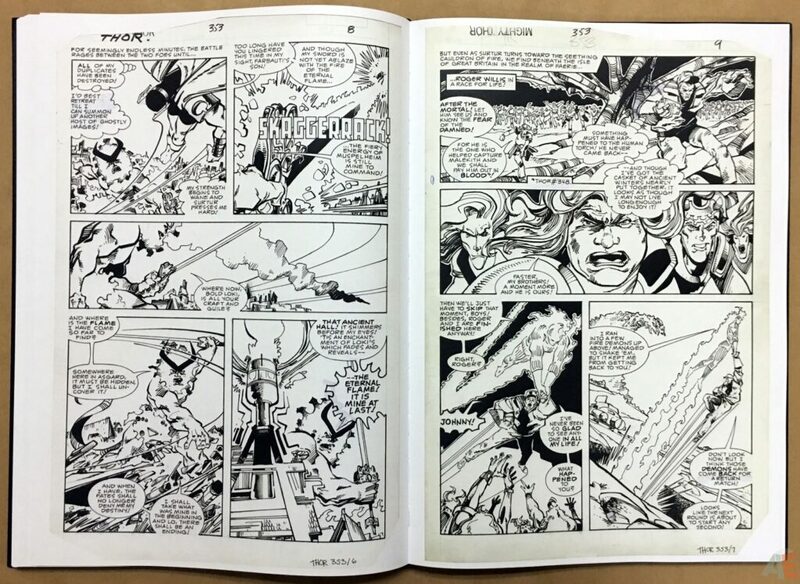 As Simonson keeps all his artwork, we’ve got a complete storyline with The Mighty Thor issues 349-354, including covers! 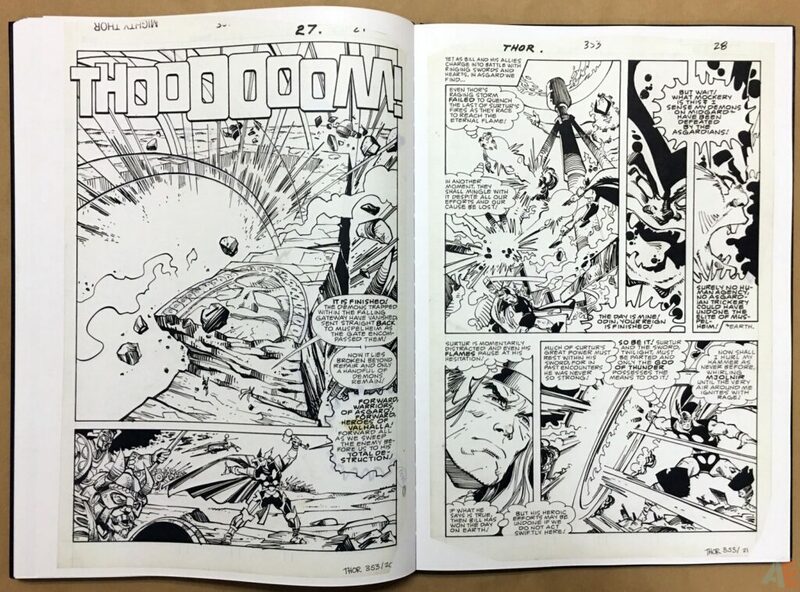 Plus issue 380 that was inked by Sal Buscema which featured every page as a splash. Also included is a small gallery section of various Thor and Beta Ray Bill illustrations. 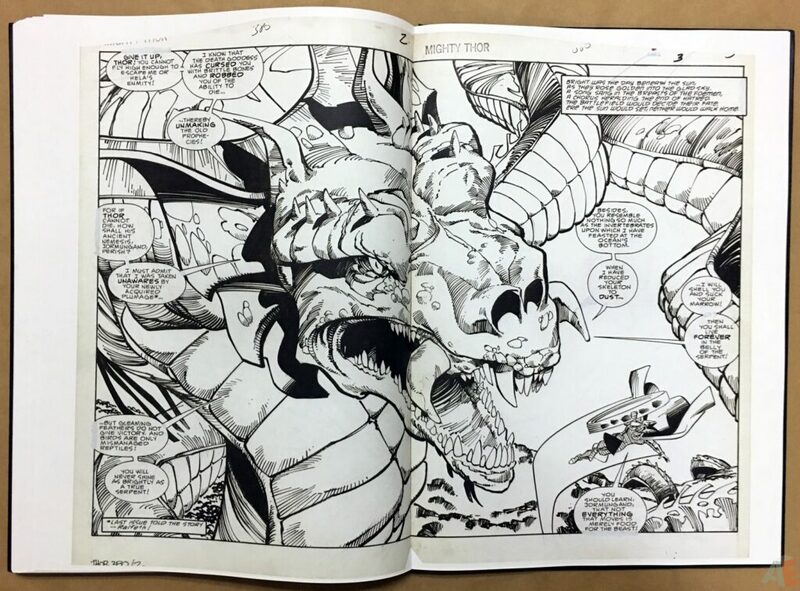 A complete package if there ever was one. Scans are clean and clear; no softness or blurring. 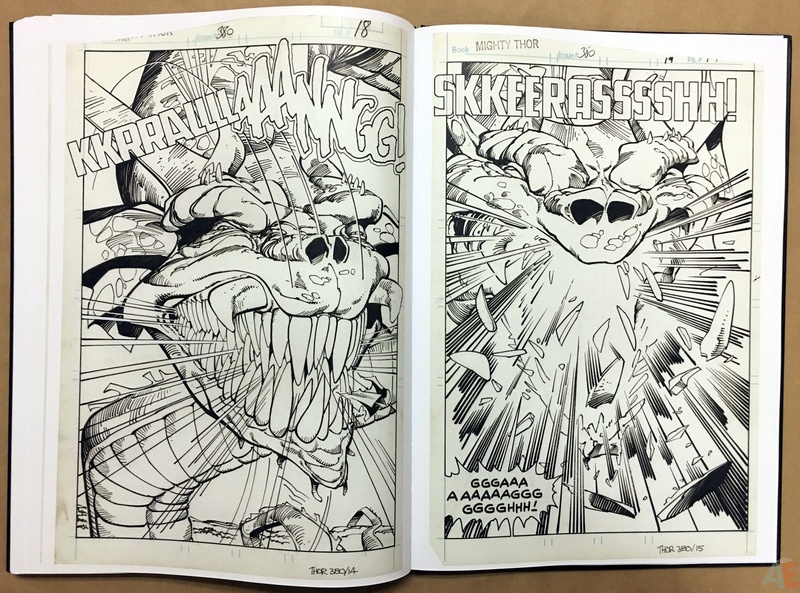 Small uses of correction fluid, along with a moved word balloon and an erased world balloon. 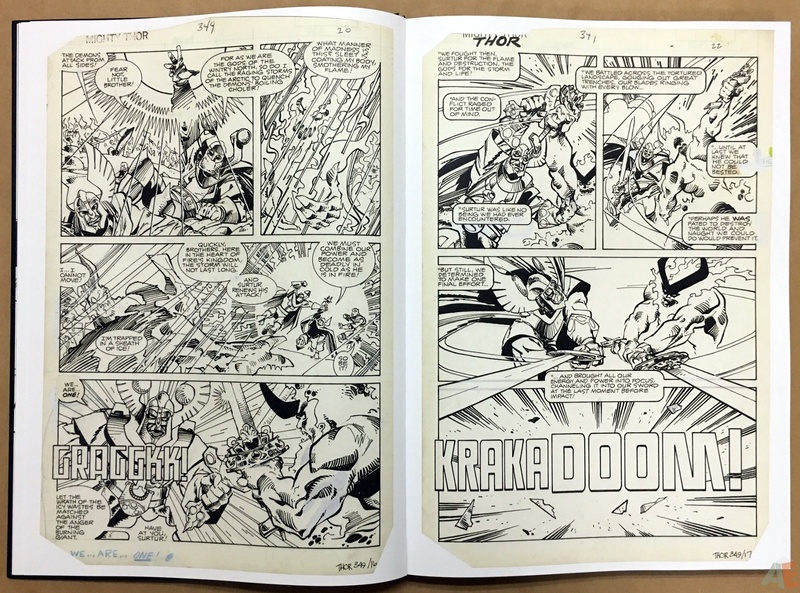 Simonson’s inks are consistently black, but Buscema’s inks show gradients. 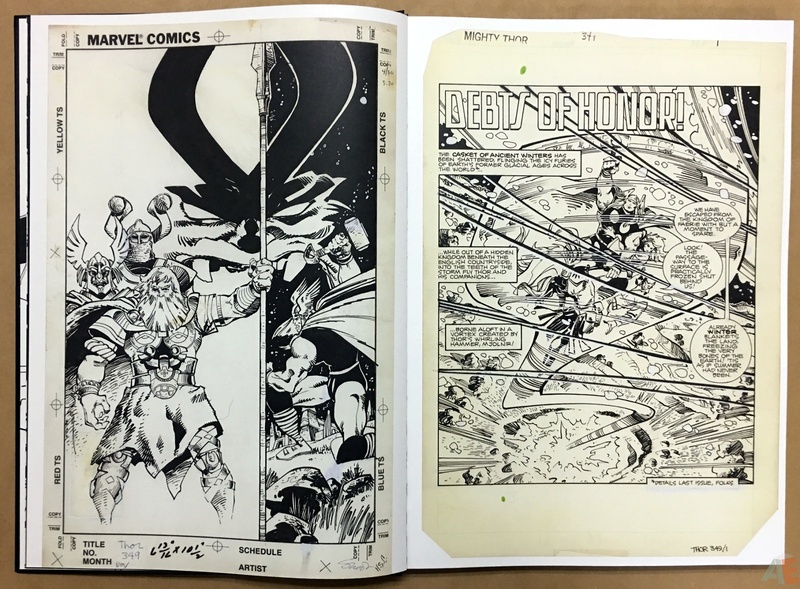 No notes on the allSimonson issues, but he did neatly label and number the pages along the bottom. A small note in issue 380. 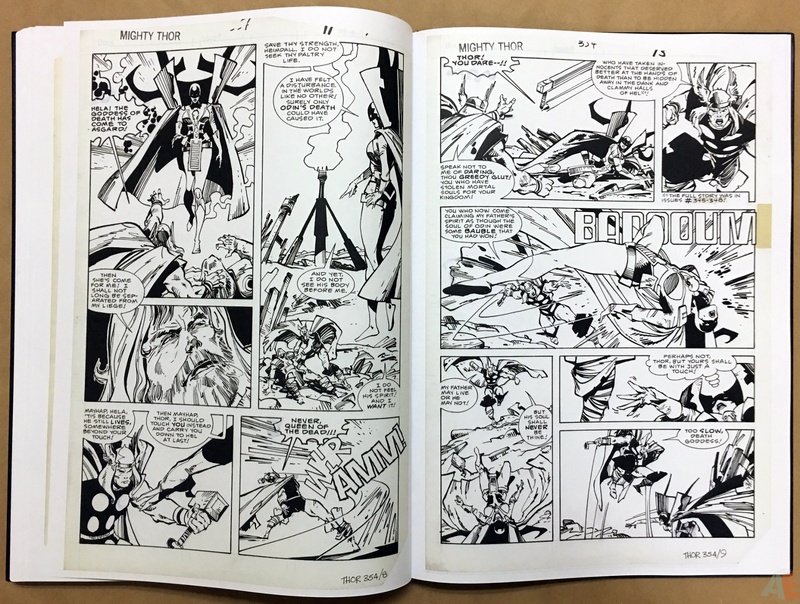 Dahlk has tied in this design with the previous volume, but with a brighter palette. 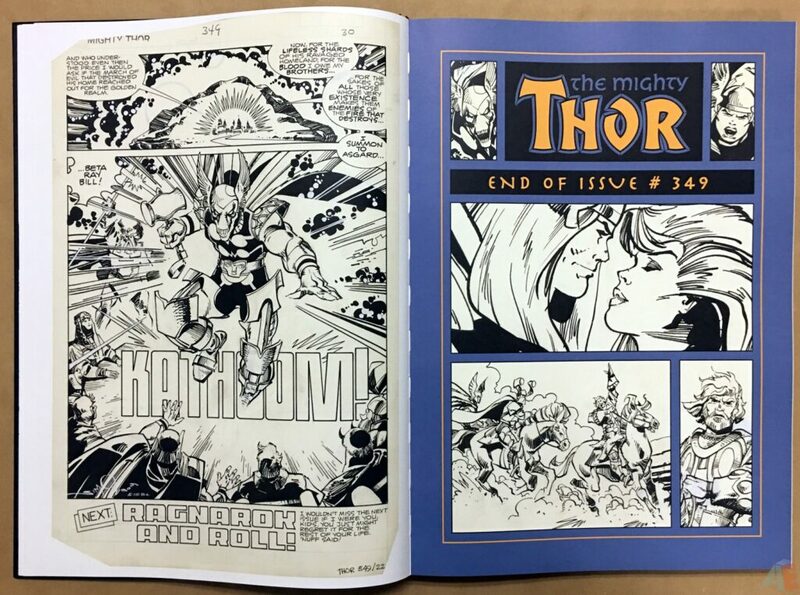 The blue and orange (or is that yellow) work exceptional well throughout. 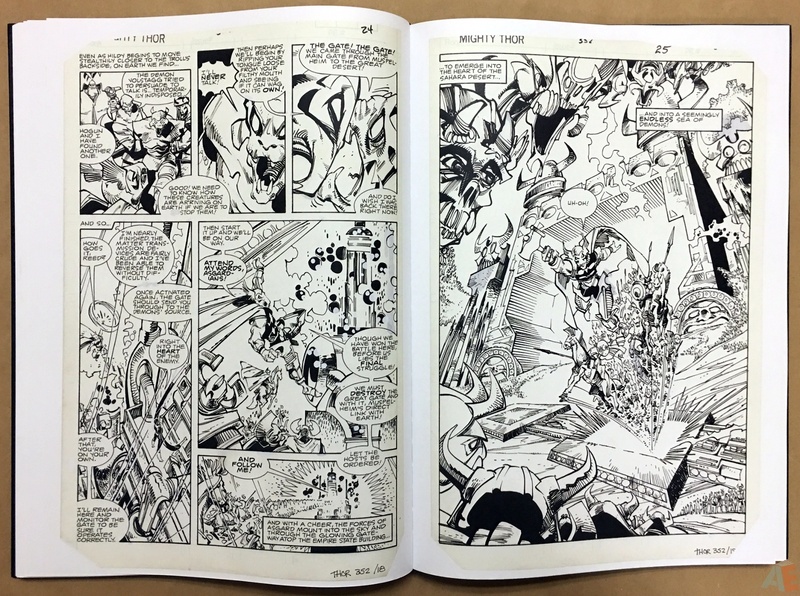 Dahlk has also created chapter breaks with panel art from the issue; a return to some of his classic Artist’s Edition design. 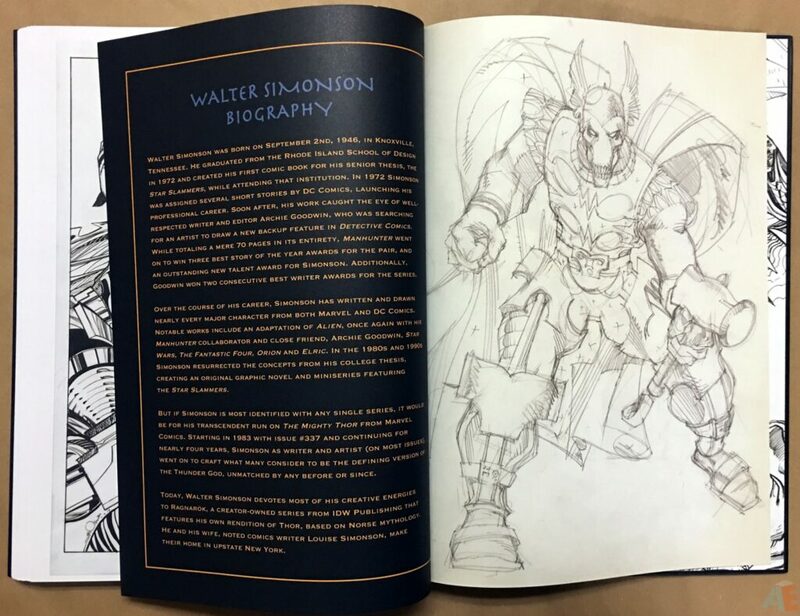 The production is IDW excellence: thick matte paper stock in a sewn binding. 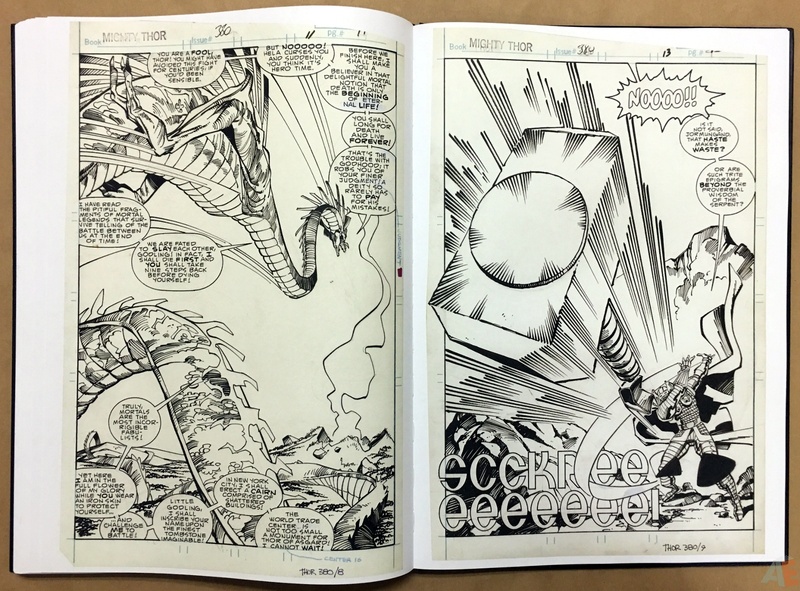 Most pages lay flat when center is smoothed. 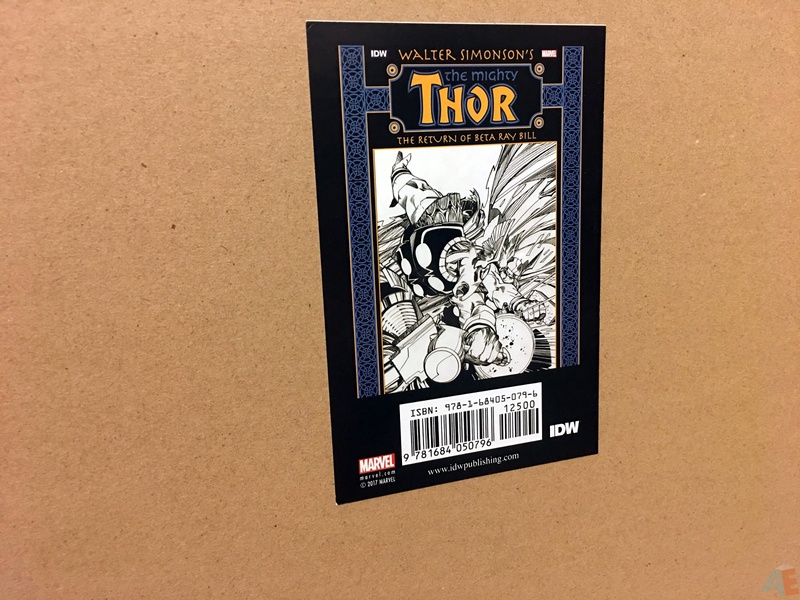 The book comes shrink wrapped in a cardboard case with a small colour sticker showing cover and UPC. 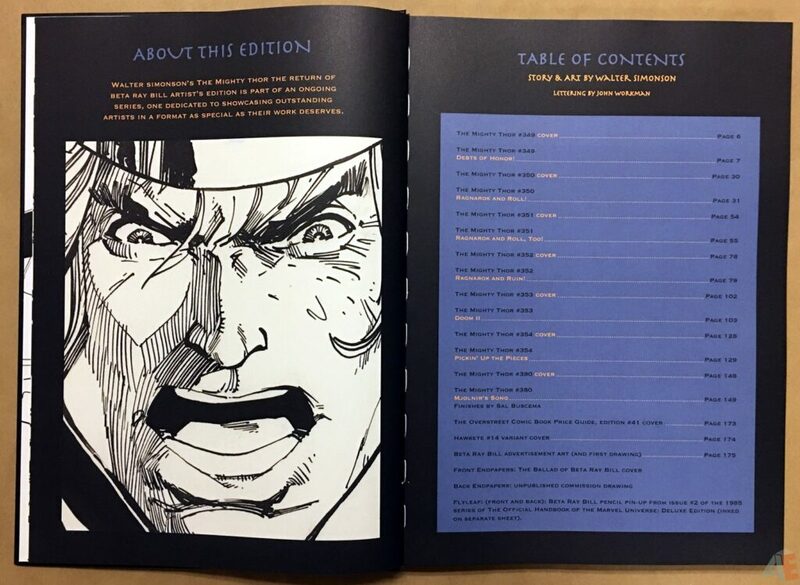 Finally, here is Scott Dunbier introducing this wonderful volume.